There are often disagreements about which is better, the cover or the original. I usually agree that it’s the original, especially if it’s a true or sad story based on a real life experience because that would have come from the heart. That’s looking at it from a lyrical point of view, musically it could be a different story. This week’s suggestion was certainly made famous by the cover version as the original was never released as a single, and the originator of it, whilst being one of the 20th century’s most prolific songwriters, he is no singer. After all, in 1985 many commented that this singer was well out of place on the USA for Africa charity hit, We Are the World. Yes, it’s Bob Dylan and his song All Along the Watchtower. 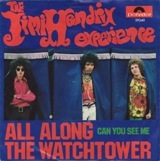 The other two members of Jimi’s Experience were, Noel Redding on bass, and Mitch Mitchell on drums, however Redding is not on the recording of All Along the Watchtower. He was also playing in a band called Fat Mattress which Hendrix often, sarcastically, referred to as Thin Pillow and Hendrix was not convinced that Redding was putting all his effort into the Experience and so Hendrix played bass himself.